This team is my favorite. Hubby and I watched every episodes of the show and we have our own favorite. Hubby likes JJ. Each characters are unique but, the character of Penelope Garcia portrayed by Kirsten Vangsness is what I adore the most. Penelope is the girl at the far right in the picture. She is the FBI's Technical Analyst and very good in her character. In fact, in Criminal Minds: Suspect Behavior , she retained her role. If you haven't seen this show, I highly recommend that you watch it. 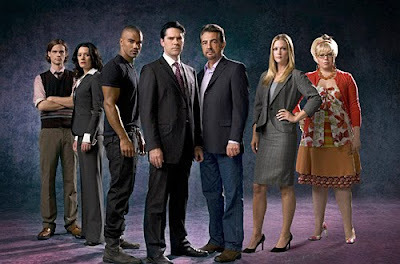 L-R Characters: Dr. Spencer Reid, Emily Prentiss, Derek Morgan, Aaron Hotchner, David Rossi, Jennifer "JJ" Jareau, Penelope Garcia. One of my favorite shows Ams.